Murtha Cullina LLP is consistently recognized by leading legal publications for the achievements of our firm and individual attorneys. The following are some of our rankings and accolades. Chambers USA identifies and ranks the world's best lawyers based on criteria most valued by clients - such as technical expertise, business acumen, prompt delivery, value for money. Chambers USA recognized several individual attorneys and practice areas. For more information click here. Chambers High Net Worth covers private wealth management work and related specialisms in key jurisdictions around the world, featuring in-depth editorial about the leading lawyers and law firms for wealthy individuals and families. Chambers HNW also features listings and information about many of the top accountancy and tax firms, private banks, wealth management firms and multi-family offices acting for high net worth individuals. For more information click here. Martindale-Hubbell® Peer Review Ratings™recognize lawyers for their strong legal ability and high ethical standards for more than a century. For more information click here. The Best Lawyers in America is the oldest and most respected peer-review publication in the legal profession. Two of our attorneys were selected by their peers for inclusion in the legal referral guide. In addition, the firm was ranked in the Best Law Firms rankings in U.S. News & World Report. For more information click here. SuperLawyers names top attorneys in each state as chosen by their peers and through independent research. Rising Stars names the state's top up-and-coming attorneys. Twenty-eight of our attorneys were selected to the Connecticut SuperLawyers and Rising Stars (*) list. For more information click here. 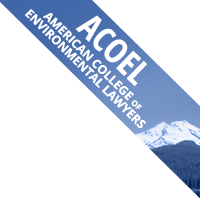 American College of Environmental Lawyers (ACOEL) is a professional association of distinguished lawyers who practice in the field of environmental law. Membership is by invitation and members are recognized by their peers as preeminent in their field. ACOEL members are dedicated to: maintaining and improving the ethical practice of environmental law; the administration of justice; and the development of environmental law at both the state and federal level. Click here to learn more. Who's Who Legal publishes an International Who's Who of Environment Lawyers. The publication lists attorneys that are experienced in the areas of environment law and policy. Click here for more information. Benchmark provides general counsel at the country's preeminent corporations, investment banks, and financial institutions with analysis of the best commercial and financial litigators and law firms in the United States. Murtha Cullina is recognized as a Recommended firm. For more information click here.